"I'm just a girl from the country. The theater and the people in it have always been a complete mystery to me. They still are." When a glamorous actress plays drab and dowdy, Oscar inevitably comes calling�at least it did for Grace Kelly. She won the gilded statuette for her sincere, if less than dazzling portrayal of an alcoholic's plain, long-suffering wife in The Country Girl, an adaptation of a Clifford Odets play. Wearing tattered sweaters, frumpy blouses, and little makeup, Kelly successfully hides her beauty. She even shoves her trademark blonde hair into a matronly bun. And by shuffling her feet, slumping her shoulders, and lowering her vocal register, she chucks her patrician persona and impersonates a downtrodden, cynical woman. The carefully constructed transformation often shocks audiences accustomed to seeing Kelly glide across parquet floors in designer evening gowns and engage in playful banter with Jimmy Stewart and Cary Grant. But despite her valiant exterior efforts, Kelly never seems to feel the inner anguish and frustration that drives her character. Oh, she cries on cue and barks with bite, but it never feels real, never wrenches our gut. It always seems like, well, acting. Compare that with Kelly's fellow Best Actress nominee, Judy Garland, who the very same year also played an alcoholic's long-suffering (albeit more stylish) wife in A Star Is Born. Raw, sensitive, and heartbreakingly natural, Garland projects what Kelly lacks, and many, myself included, believe she deserved the Oscar. (Groucho Marx called Kelly's victory over Garland "the biggest robbery since Brink's!") Although I wasn't even born when the awards were handed out in 1955, I've never forgiven the Academy. 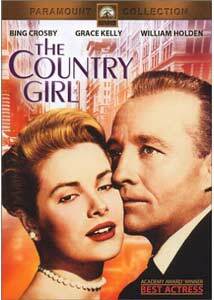 And whenever I see The Country Girl, my resentment recurs. Such bias, however, doesn't cloud the fact that George Seaton's solid production was a breakthrough for Kelly, proving she could handle a substantive role and play characters other than cool society ladies. Yet ironically, not only does Kelly not give the best performance of the year, she doesn't even give the best performance in The Country Girl. That honor unquestionably goes to Bing Crosby, who reached his apex as a dramatic actor (and received an Oscar nomination) as Frank Elgin, a washed up Broadway star who hits the bottle after his young son's tragic death. Crosby sinks his teeth into the role, brilliantly conveying the deceit, manipulation, selfishness, and crippling insecurities that go hand-in-hand with alcoholism. The film's inclusion of a few too many songs may dilute the power of Crosby's portrayal, blurring the lines between his character and beloved image as buh-buh-buh-Bing, but the actor remains true to the part, and never shies away from addressing his advancing age or looking haggard and worn. He also emotes with abandon, creating an uncompromising portrait of a deeply troubled man. Buoyed by the confidence and admiration of cocky stage director Bernie Dodd (William Holden), Frank agrees to step into the lead of a new Broadway musical just weeks before its out-of-town tryout. Bernie believes the show will help Frank get back on his feet and regain his self-respect, but worries Frank's domineering wife Georgie (Kelly) will micromanage him off the wagon. Bernie and Georgie repeatedly clash over what's best for Frank�he disapproves of her involvement in Frank's professional affairs, and wonders whether her presence aids or abets her husband's illness. Frank, on the other hand, can barely function without Georgie, depending on her to constantly bolster his confidence and offer unqualified love and support. He also manipulates Georgie into handling sticky business matters, so he can maintain his easygoing, problem-free image and she can be viewed as grasping and difficult. The stress wears heavily on Georgie, but she hides her pain with a coarse, abrupt demeanor. Her affection for Frank runs deep, but the years of care, suspicion, and disappointment have taken their toll, and her aching desire for peace makes her question her commitment to him. Still, she toils on, struggling valiantly to keep Frank and her marriage together, until a moment of passion with Bernie takes her life in a new direction. Unfortunately, that indiscretion so blindsides the audience, it becomes almost laughable. Hate often masks love in movies, but Kelly and Holden show not the slightest hint of attraction or desire in their prior confrontational scenes. Holden spends most of the film gruffly rebuking Kelly or exploding with rage, so his eleventh hour tenderness seems more like a dramatic ploy to soften his character than an honest outpouring of emotion. As a result, the movie's last act becomes little more than a standard love triangle, and all but abandons the searing premise of how alcoholism can irrevocably alter a marriage and career. Then again, this isn't Days of Wine and Roses, and maybe, in 1954, audiences weren't ready for such uncompromising realism. A Star Is Born, however, traverses much the same territory in a less contrived manner and provokes a more visceral response. Is that because Garland's portrayal outclasses Kelly's? To me, the answer is obvious. Image Transfer Review: Far better black-and-white transfers exist than this average effort, but despite some flaws, The Country Girl looks fine on DVD. The source print exhibits typical grit and debris for a film of this vintage, and though the marks often annoy, they're easy to ignore. Grain, however, seems more noticeable than in other productions from the same period, lending certain scenes an unsettling gauzy quality. Black levels are rich and solid, but contrast and shadow detail seem a bit weak, which results in a dull, flat look. Such somber tones might be intentional, but become overbearing when transferred to the digital medium. Still, close-ups are crisp and little evidence of edge enhancement exists. Audio Transfer Review: The mono track has been nicely cleaned up, with any hiss, pops, or other pesky defects eradicated. The result is clear, easily understandable dialogue, and smooth silences that often heighten dramatic impact. The musical sequences sound rich and full, showcaing Bing's dulcet baritone. Extras Review: Another barebones classic release from Paramount, The Country Girl disc includes nothing more than chapter stops. A documentary on any of the three principals would have been a welcome addition and enhanced the film, but no such luck. Although Grace Kelly won the Oscar and plays the title role, Bing Crosby walks away with the acting laurels in The Country Girl, filing his finest dramatic performance as a disillusioned alcoholic struggling to beat the bottle. An engrossing story and considerable star power help maintain interest, but despite seven Academy Award nominations (including Best Picture and Best Director), The Country Girl fails to reach the heights of other films with similar themes. Still, George Seaton's well-made drama deserves a look, if only to admire Crosby's impressive portrayal.